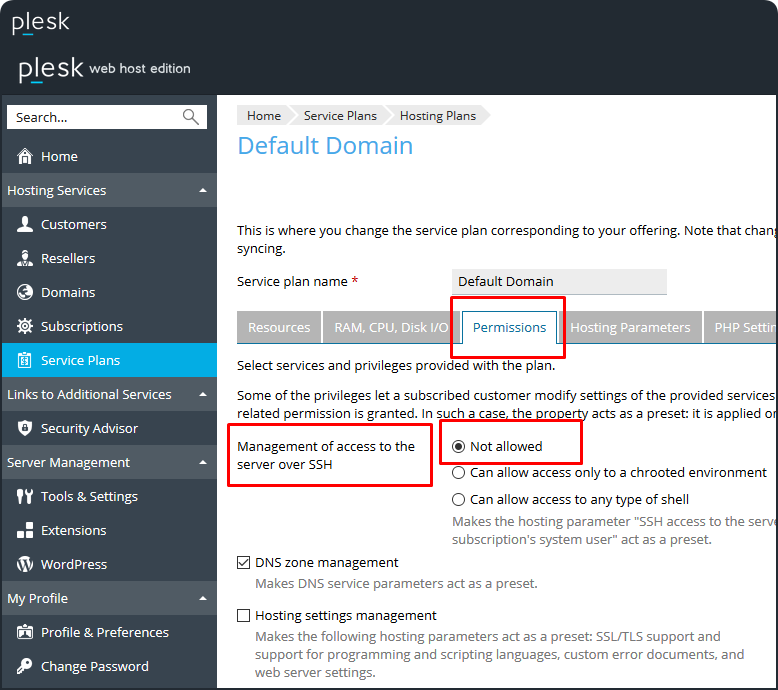 How to give limited SSH access to Plesk domain's system user? Warning: SSH access allows the domain owner accessing the SSH interface under subscription's user account with non-administrative access. It can be provided only for system domain user. This type of access does not allow the user applying administrative commands and it cannot be used for applying instructions in other Plesk articles. In this case, the home folder for the user will be the same as specified in Plesk > Domains > example.com > Hosting Settings is provided. Video instruction "How to provide SSH access for domain's system user"
Note: If the menus are different, upgrade to the latest Plesk version or contact server's administrator/hosting provider. Go to Plesk > Domains > example.com > Web Hosting Access. Note: The non-selectable Forbidden value for non-admin users means that the Management of access to the server over SSH permission is set to Not allowed in the subscription and/or service plan settings by the service provider. Follow instructions from this article to add such permissions to the subscription. Values Forbidden, /sbin/nologin or /usr/sbin/nologin will restrict SSH access to a user, the rest of options will allow SSH access. If Management of access to the server over SSH is allowed, the change will not be propagated to existing subscriptions - only to newly created ones. 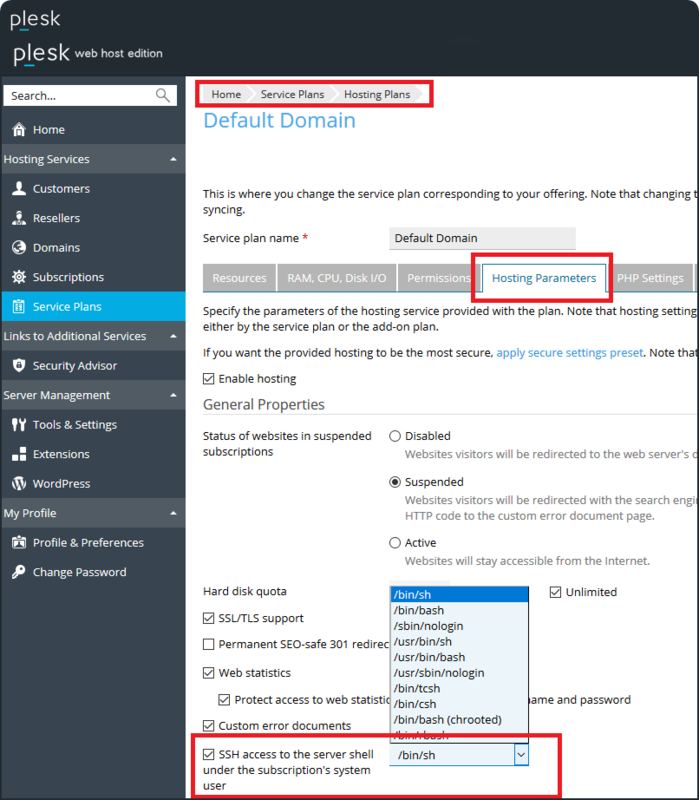 See Plesk Guide for more details: to preserve the modifications made by customers, Plesk does not sync a plan property if a related permission is granted. Click the Update & Sync button to apply changes and synchronize subscriptions with the service plan. Hi, how do i allow permission to user over SFTP to only httpdocs folder not root? Such functionality is not implemented in Plesk. SFTP works over SSH and subscription users are able to access all files of subscription. New features may be suggested here. Sorry, to ask this simple question. I executed the command with john_doe and got no output. Is the name john_doe only a placeholder for a real name (customer) or is john_doe himself a real account? I mean, does john_doe already exist by perhaps Plesk or Ubuntu 18 or do I have a greater problem with permissions? Another important question is, which type of access is usually used by hosters? The first one (/bin/sh) or what do you suggest? > Another important question is, which type of access is usually used by hosters? Thank you very, very much for this support. Plesk and Plesk support is great.